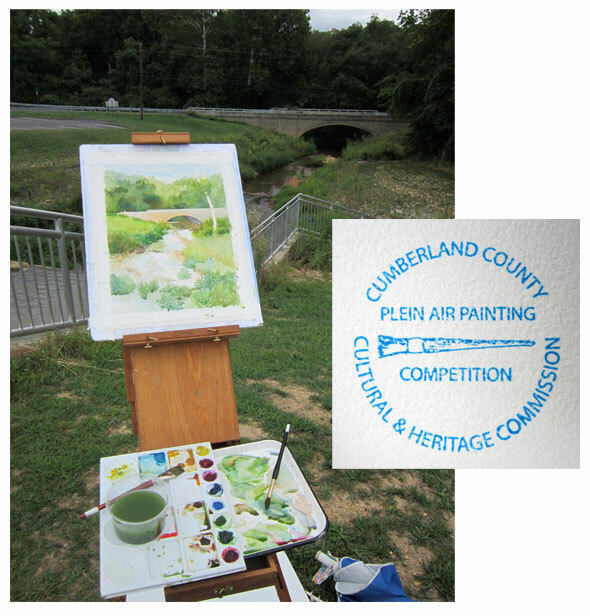 Had a great day of painting in the Hammonton Plein Air Competition. This quaint town has lots of interesting architectural buildings. I spent the day painting the Gazette building. 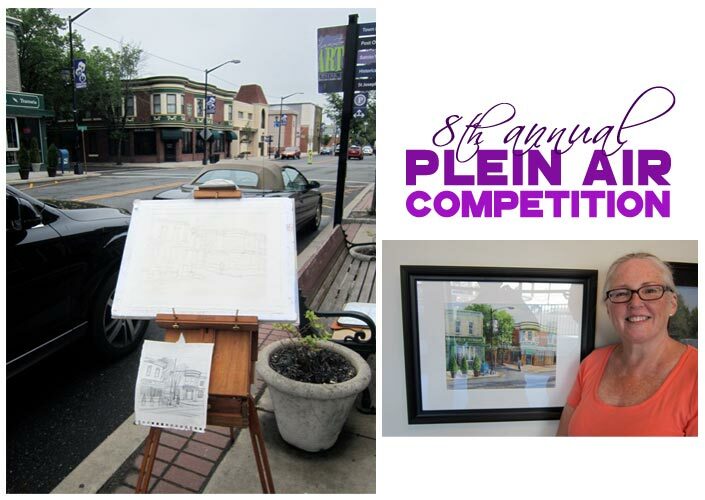 All of the paintings completed during the plein air competition will be on exhibition through Sunday at Kramer Hall Noyes Gallery, which is the newest addition to the Arts District in Downtown Hammonton, New Jersey. 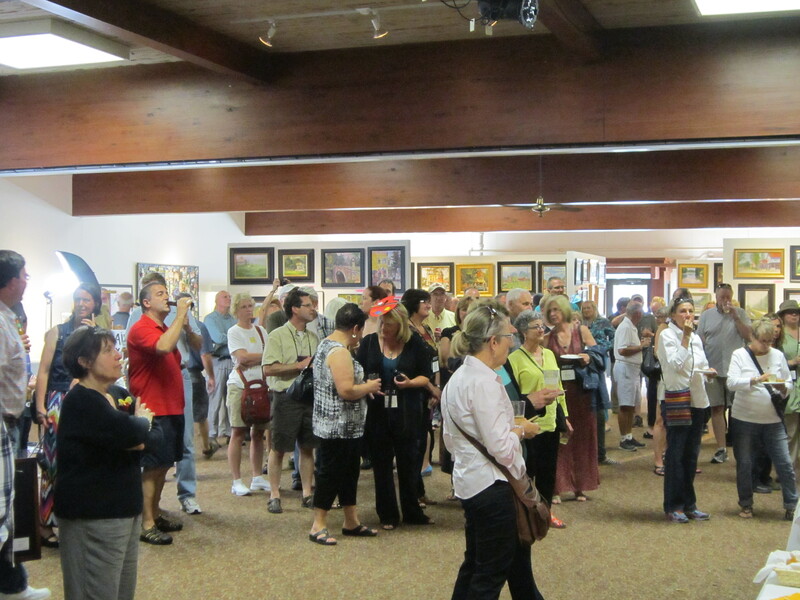 Thank you to Mike Cagno, Executive Director, Noyes Museum of Art, who made this event a fantastic experience. Heading north on Route 611, the road curves along the Delaware River. From the river banks, you can see Marble Hill. Such a beautiful spot. Hurry up spring, so I can get back to touring for great subjects! 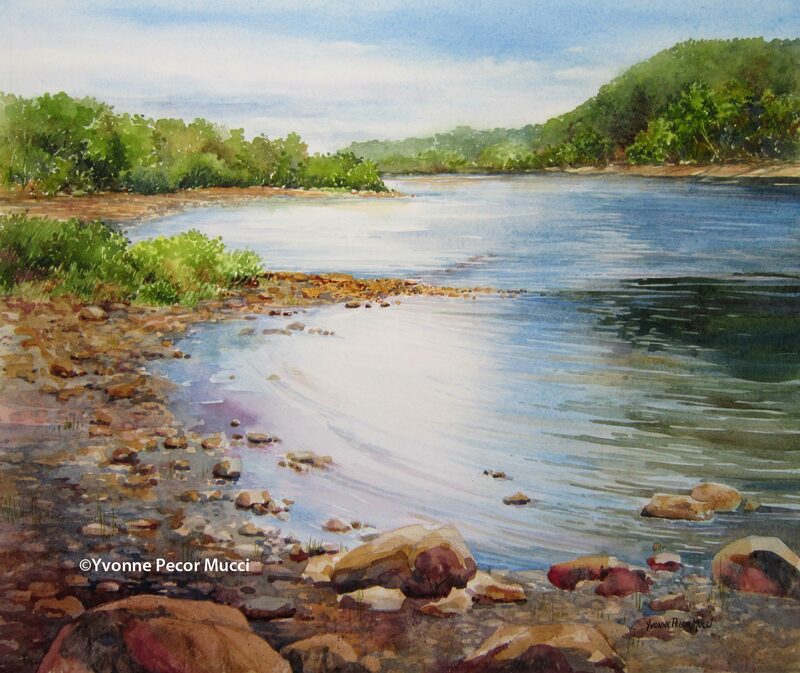 Marble Hill On The Delaware was painted in studio on 140# Arches watercolor paper. 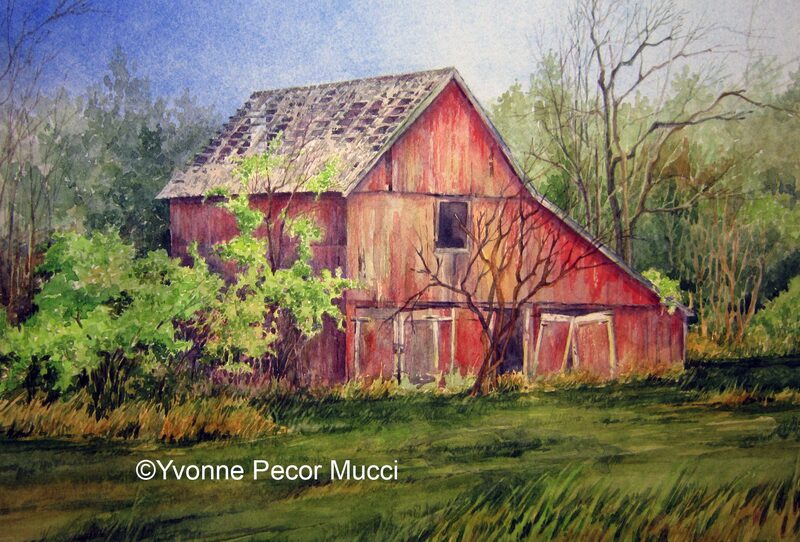 I came across this old barn in the town of Mullica Hill. These treasures are slowly disappearing, whether it is from harsh weather or community growth. I can’t resist painting these structures, especially when they are lit up by the sun. After The Storm is painted on 140# Arches cold press watercolor paper. 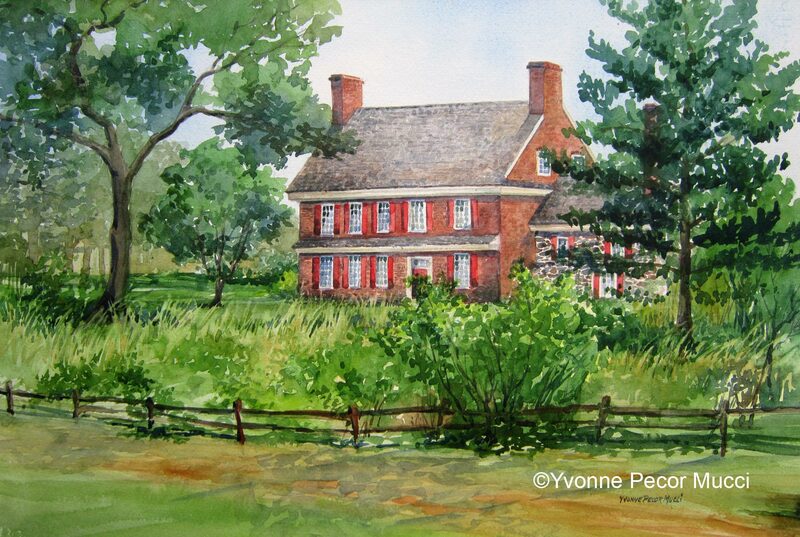 It was painted as a demo for the Salem County Art League. 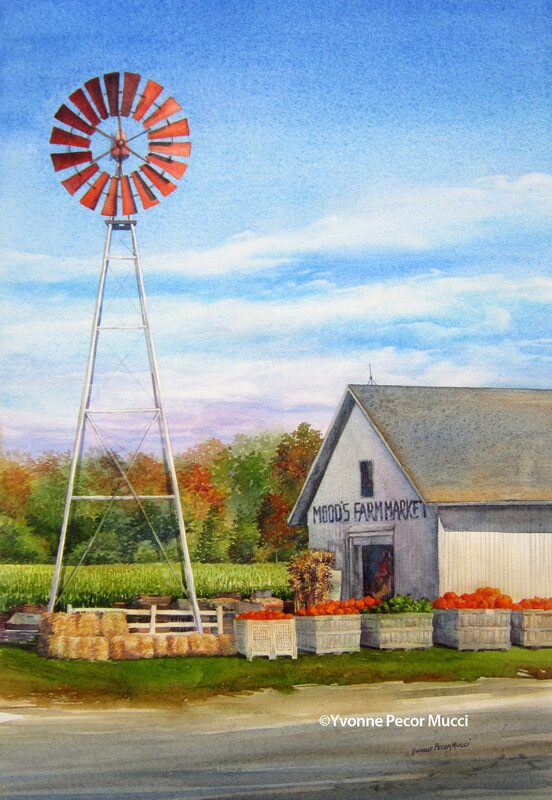 Mood’s Farm Market is a local landmark in Southern NJ. The rusty orange windmill against a sweeping blue sky was striking in contrast. I purposely pushed the color saturation to hopefully portray what it felt like to be at the market. This watercolor painting will remind me of the beautiful day I experienced picking apples while walking through the orchard. I’ll be back there come spring! The sign reads, No Trespassing! 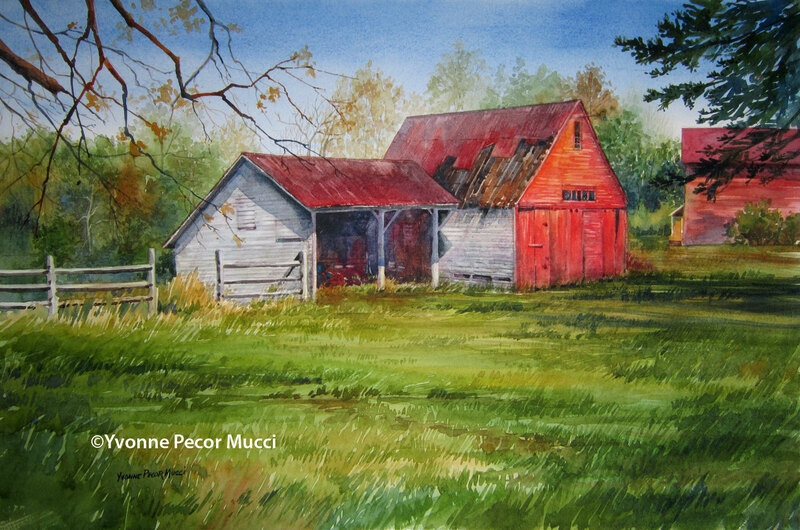 This old barn was drenched in sunlight, so I had to paint this scene. 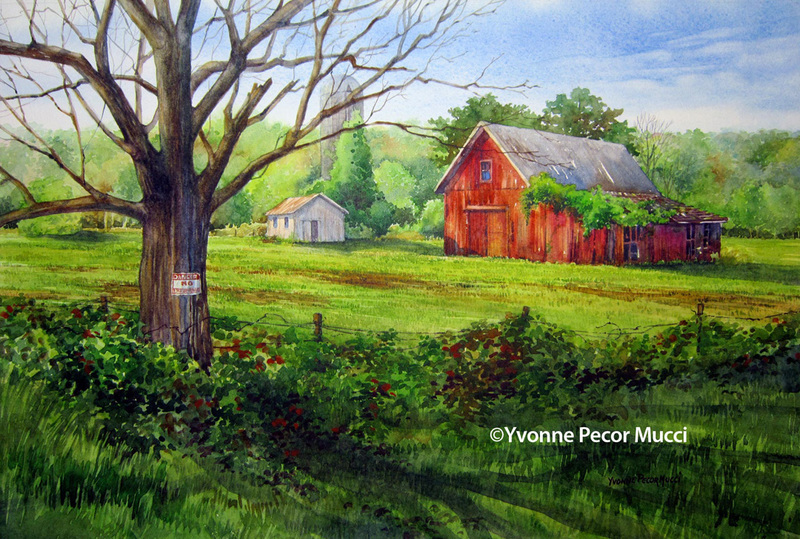 “No Trespassing” watercolor depicts one of the many vanishing landscapes being replaced by a growing community. I love seeing active farms while driving in southern New Jersey, Delaware and Maryland and hope they don’t fall by the wayside. There is nothing better than fresh produce from the farm! Buy local! 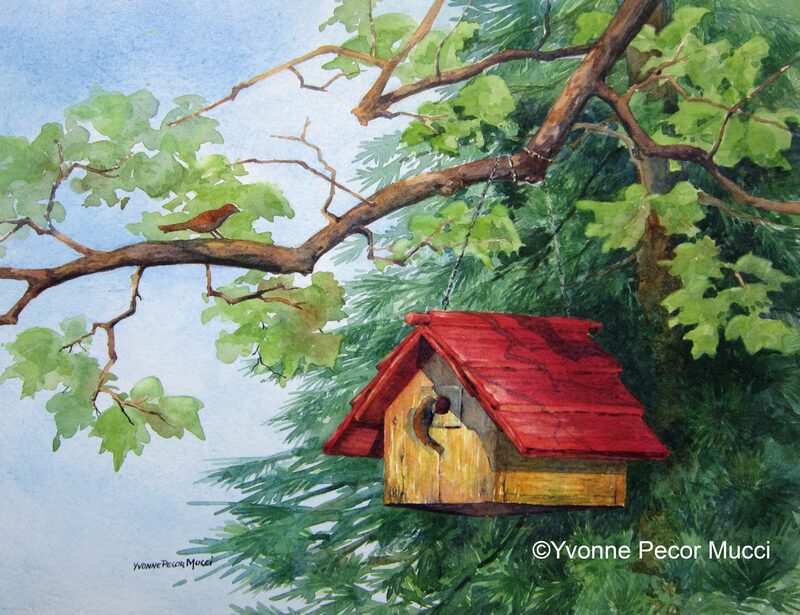 This painting was a progressive demo for my watercolor workshop. 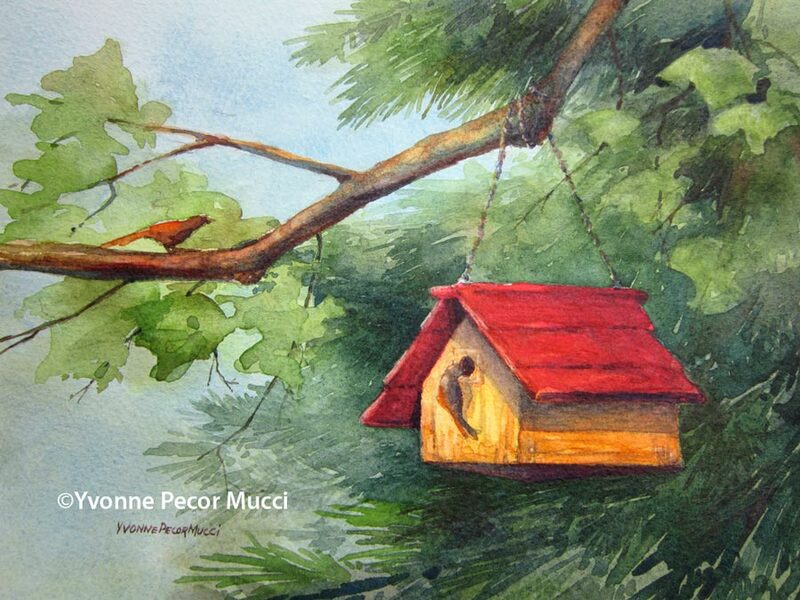 It is painted on 140# Arches cold press watercolor paper. 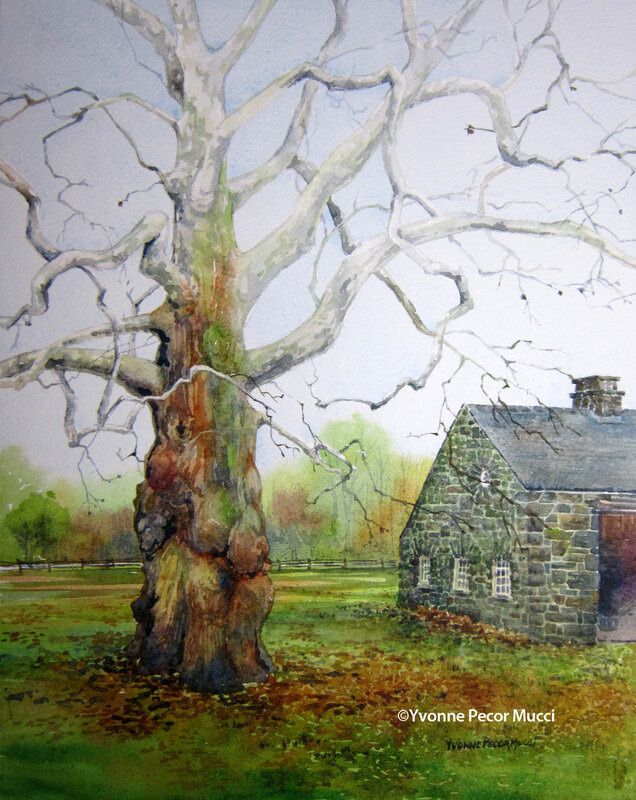 “Our Spot” watercolor was my final painting for the Plein Air Brandywine Valley competition. I had visited Winterthur two years ago in the spring and loved this particular tree that was stretching out over a bench. Thought it was in the azalea garden and it took me quite awhile to find it in the peony garden. 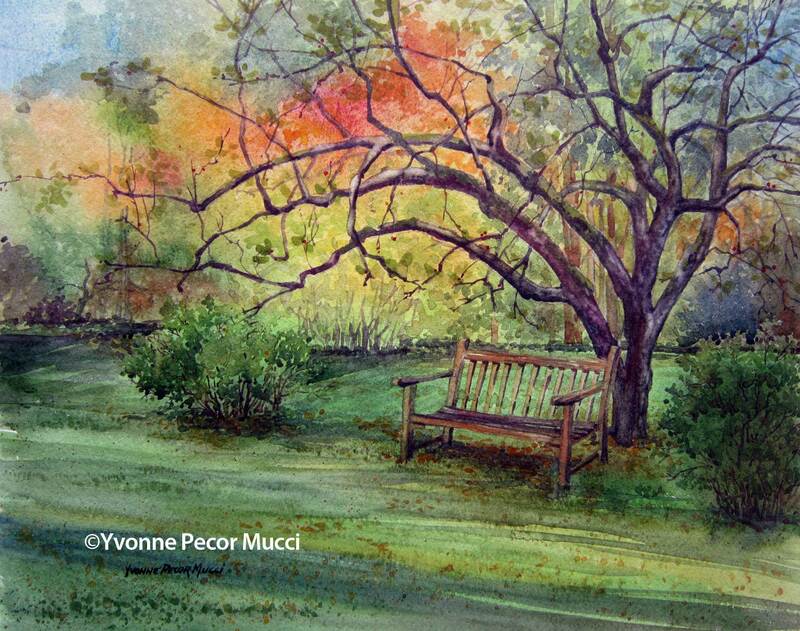 The spot was even more beautiful with the fall color bursting around the garden bench. While painting, I wondered how many had rested or had a conversation in that exact spot. Thank you to everyone that lent a hand to this competition. Can’t wait to participate again next fall! 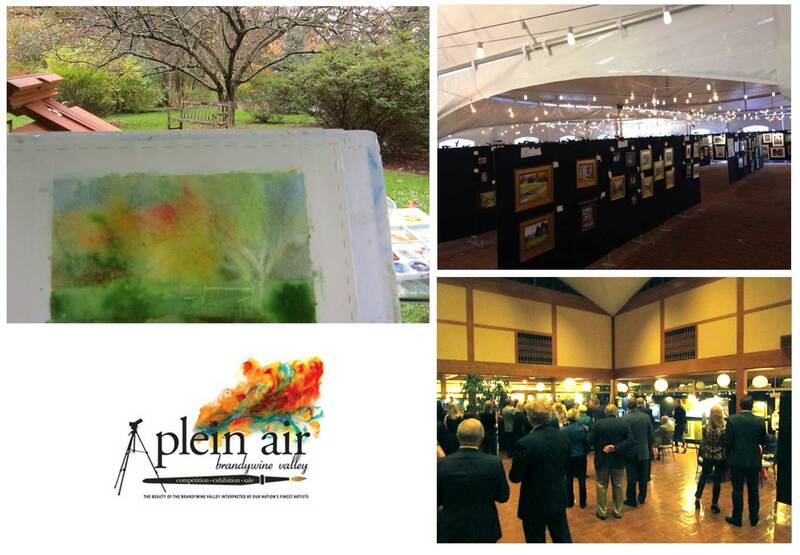 It poured rain non-stop on the 3rd day of the Plein Air Brandywine Valley competition! 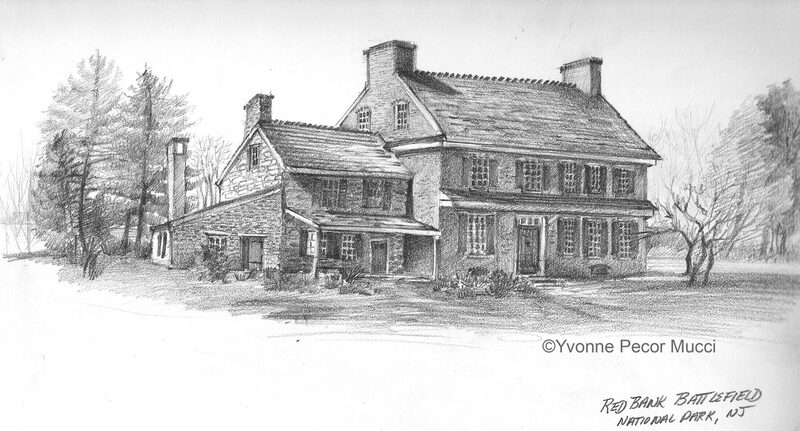 I chose to paint at Haskells (Hill Girt Farm, a local landmark) located in Chadds Ford. Such a picturesque location! This sycamore tree caught my attention with its bare white limbs reaching up to the sky. It was next to one of the smaller stone buildings on the property. The rain made the wet bark look like all the color was running down the trunk into the ground. I thought it would be an impossible painting day! With shelter from a pop-up tent and beach umbrella I gave it a go and it turned out to be an exhausting, but successful day. Thank you to the Haskell family who opened their farm for a second day to those artists that were rained out! 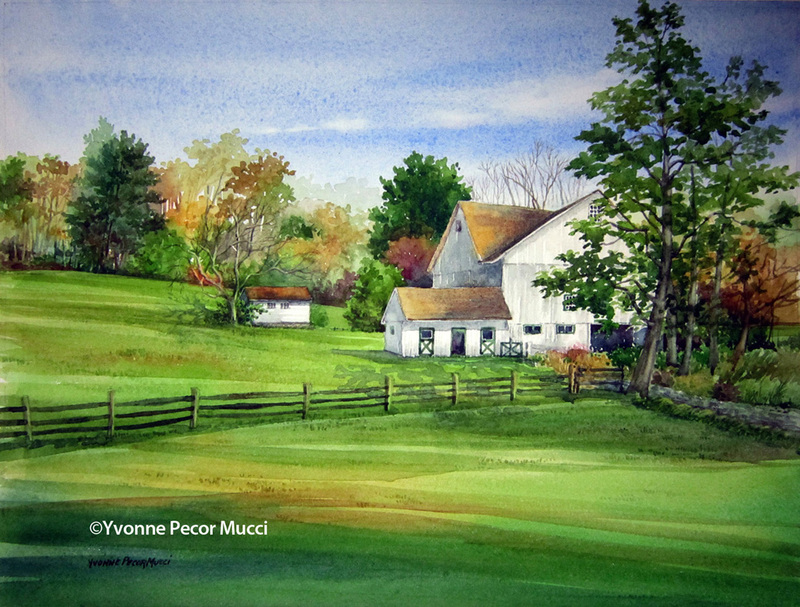 White Barn watercolor was painted on the second day of the Plein Air Brandywine Valley competition. This was the only sunny warm day to be found those four days in October! It was the kind of day that most people envision when you tell them all painting is completed from start to finish outdoors. A perfect day! Thank you to the Gahagan family who graciously allowed access to their beautiful estate … and Janssen’s Market who supplied us with delicious lunches throughout the week! The beauty of these locations was overwhelming. 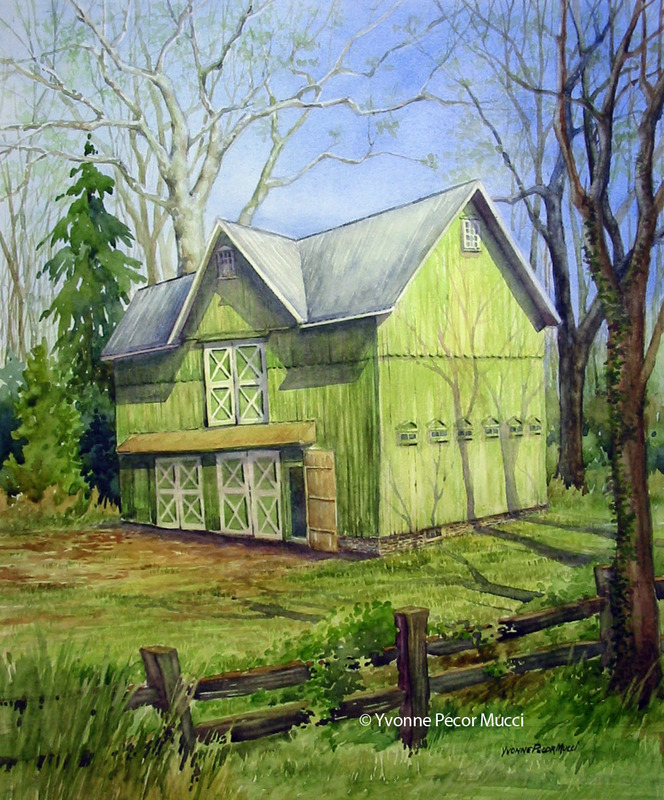 For the first day of painting I chose Auburn Heights Preserve and Marshall Steam Museum located in Yorklyn, Delaware. This 1897 Auburn Heights mansion was built overlooking the Marshall Brothers Paper Mill in Yorklyn, Delaware by Israel and Elizabeth (Lizzie) Marshall. The stone turrets were especially interesting. 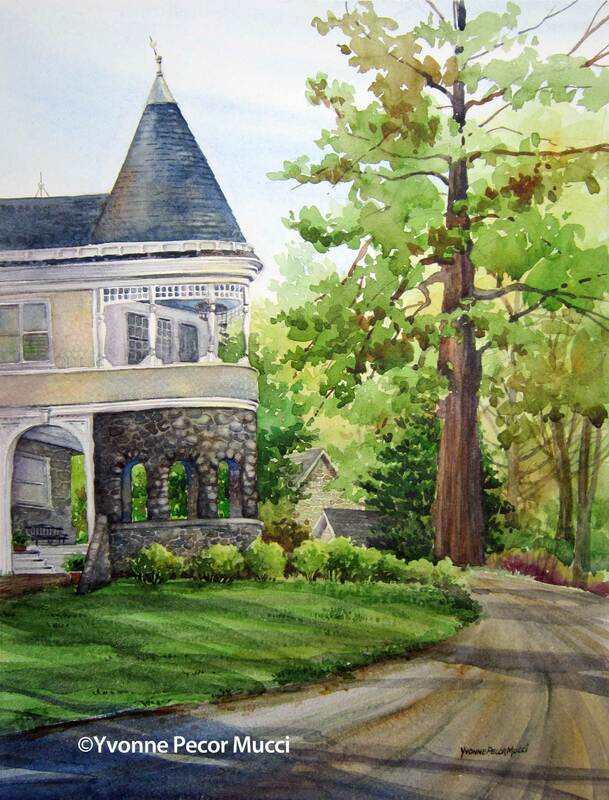 The sun was very fleeting and in spite of the cold and gray day, I really enjoyed painting this former home. I can only imagine the opulent lifestyle this Victorian family lived. Thus, the painting name “A Grand Era”. 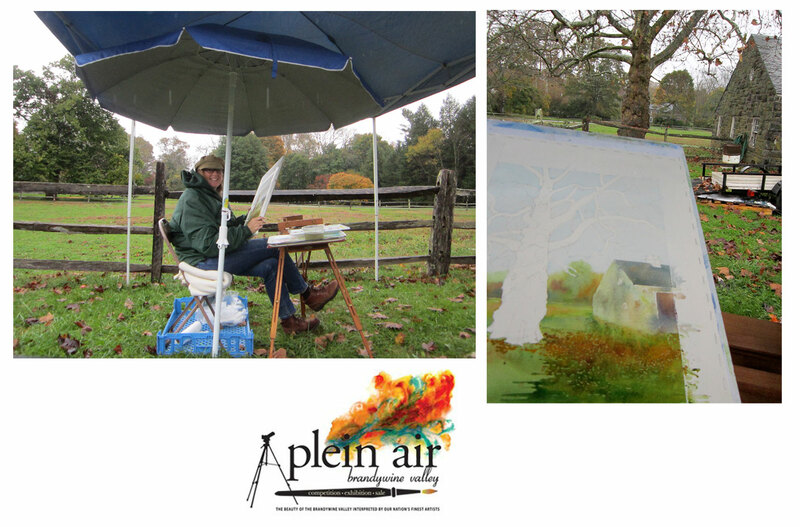 A lot of hard work goes into coordinating these plein air events. Thank you to everyone for all of your hard work in bringing plein air artists together to support the Children’s Beach House. A very gray, hazy day resulted in this watercolor painting of the jetty down the shore. When the tide is at the halfway point, fishing abounds! 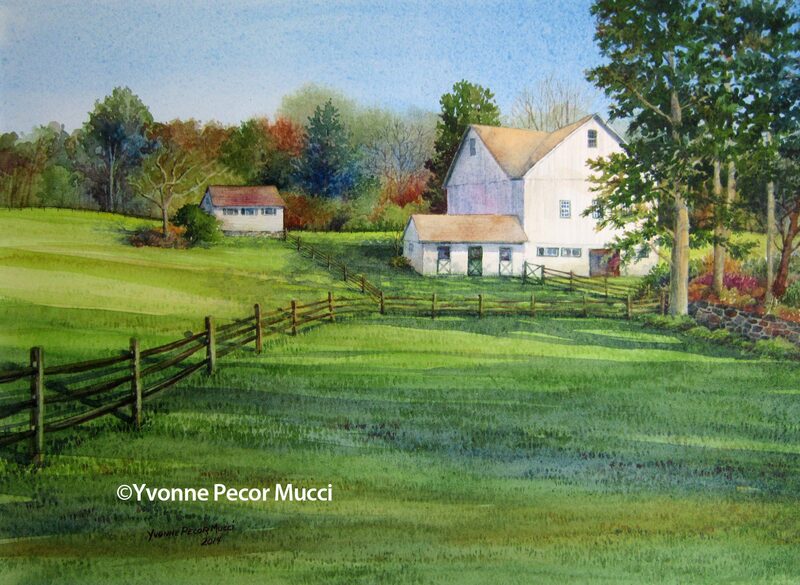 This watercolor is part of the “Nature & The Landscape, An Environmental Perspective” exhibition at Gallery 50 in Bridgeton, NJ. 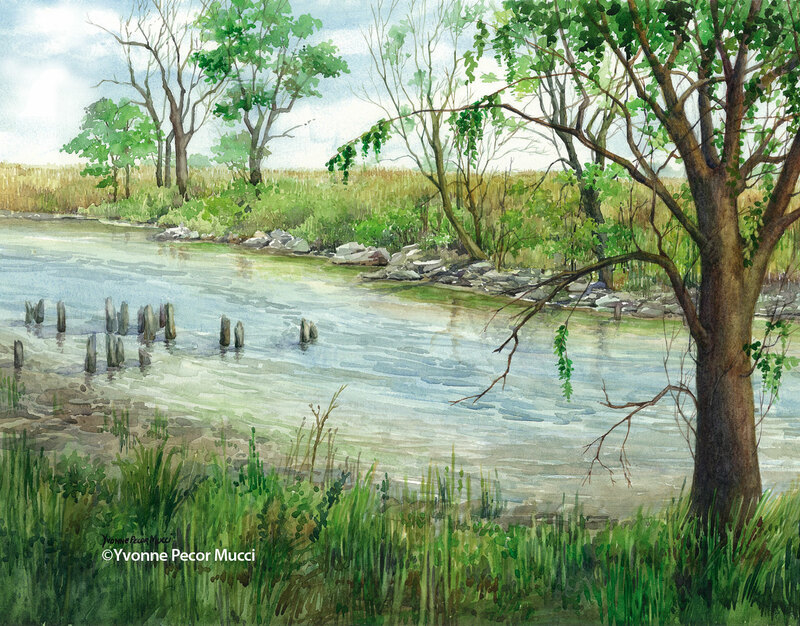 This regional wetlands competition resulted in a lot of gorgeous paintings from artists living in southern New Jersey. 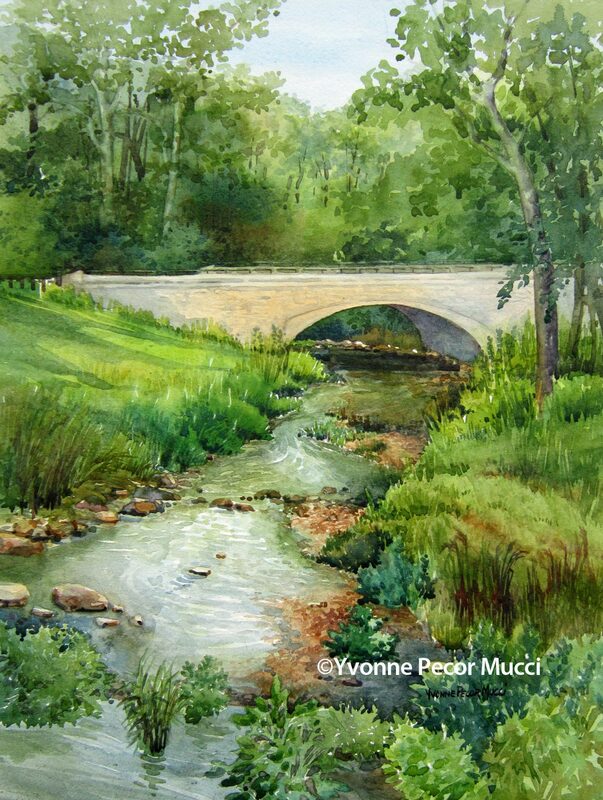 This is the 3rd watercolor painting completed for the Cedarburg Plein Air competition. It is of geraniums at the original Dietrich fieldstone dairy barn from the turn of the century. I can’t resist those stone barns, and the red geraniums were a plus. Thanks to John and Cecily who were so gracious to let me paint on their property. 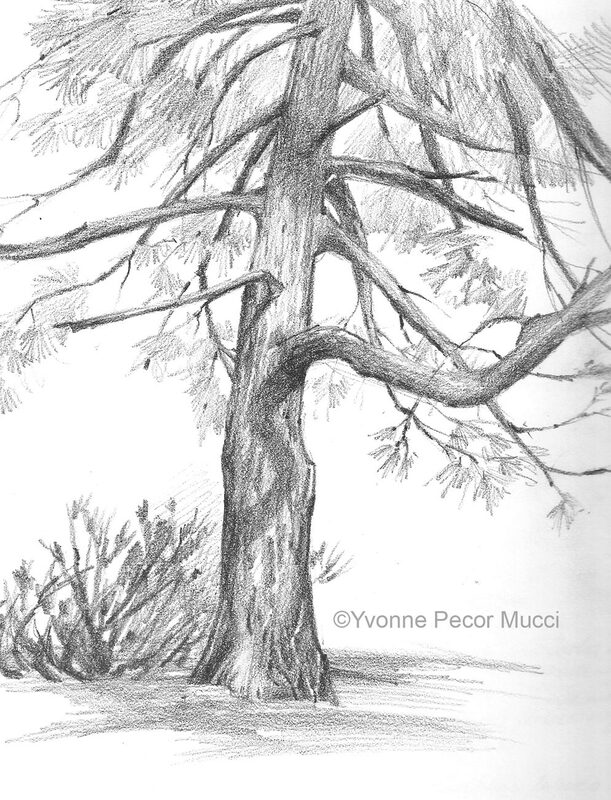 It is great fun to compete in plein air. Really pushes you to become a better artist, and you get to meet lots of other artists. 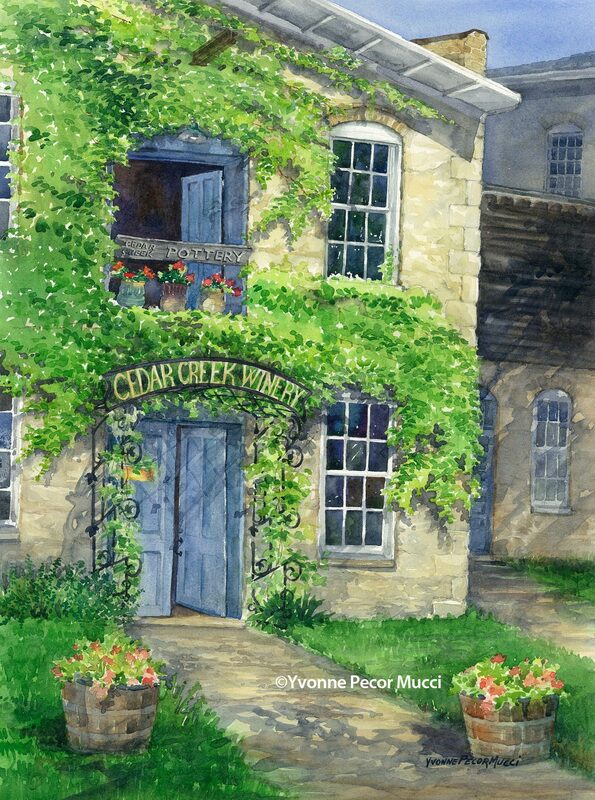 “Cheers To You!” is the second watercolor painted for the Cedarburg Plein Air competition. Such a fun event! Lots of mist while painting. I was so happy to see the sun so I could drop in the shadows. 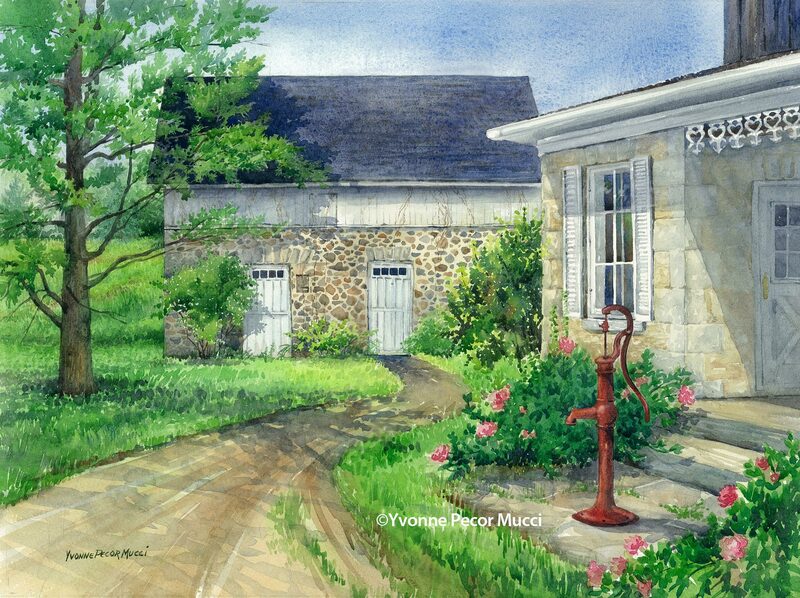 I chose this subject because of the lovely blue doors and brilliant green ivy on this historic building which currently houses The Cedar Creek Winery. 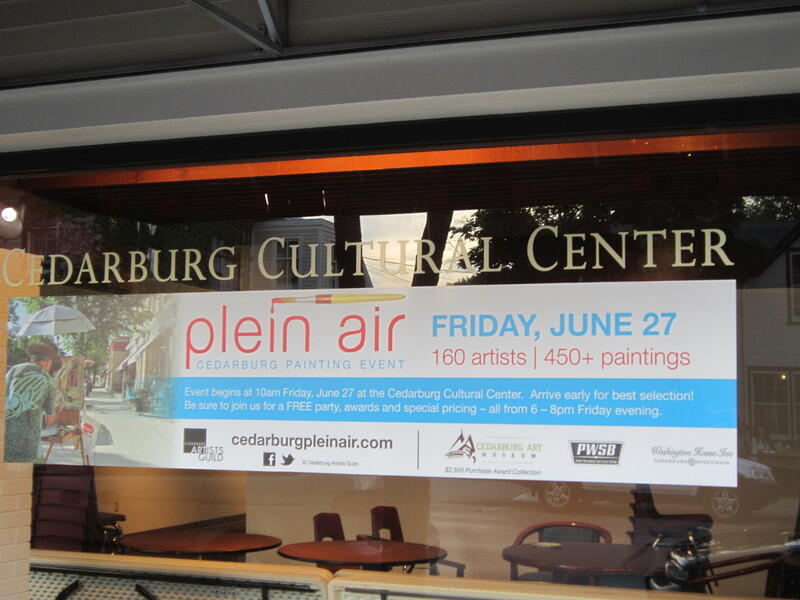 I also love the coined corners that can be found throughout the town of Cedarburg, WI. Originally the Cedar Creek Settlement (circa 1864), it was a working woolen mill until 1969 when it went out of business due to the introduction of synthetic fabrics. The winery is not only beautiful, but produces some mighty tasty wine! 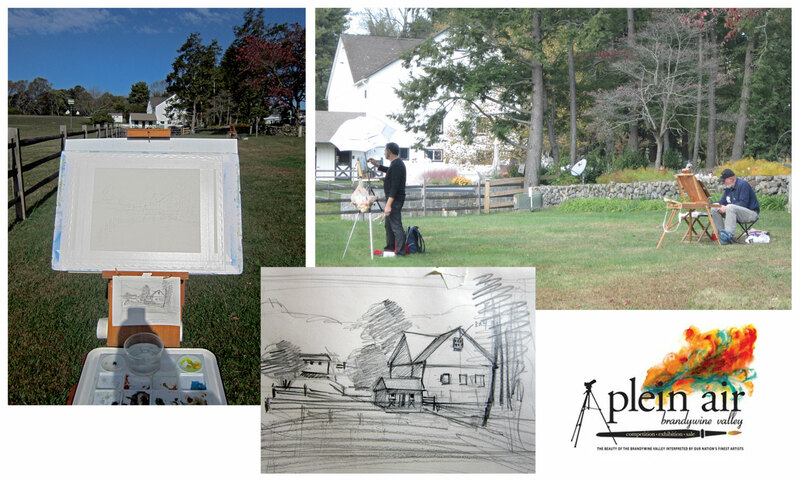 The weather is warm and the sky is blue which equals a perfect day to paint en plein air. This barn is located in Mullica Hill, NJ and currently houses a shop called The French Nest (home decor) and Canteen (a unique eatery). 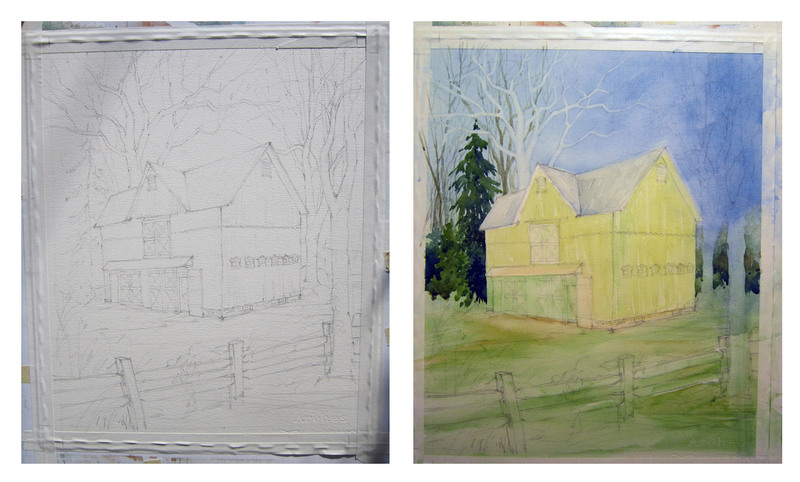 One Saturday, a friend and I set up our easels and tried to capture this green barn in watercolor. The challenge was a study of greens and how to differentiate the scene when everything has the same local color. 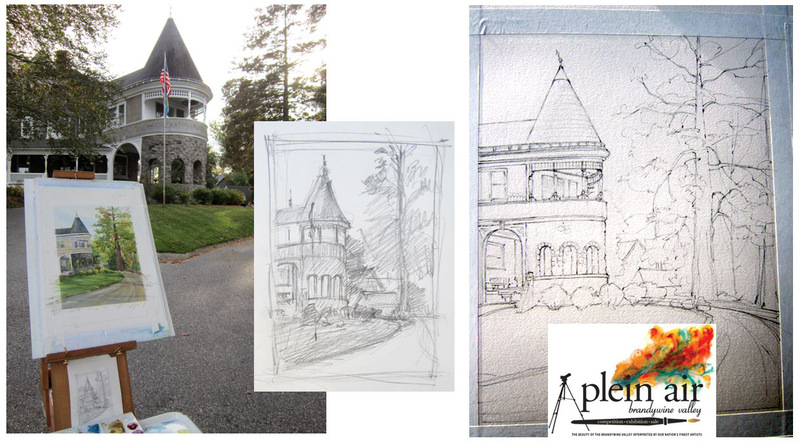 The images below show the initial drawing and color block-in. 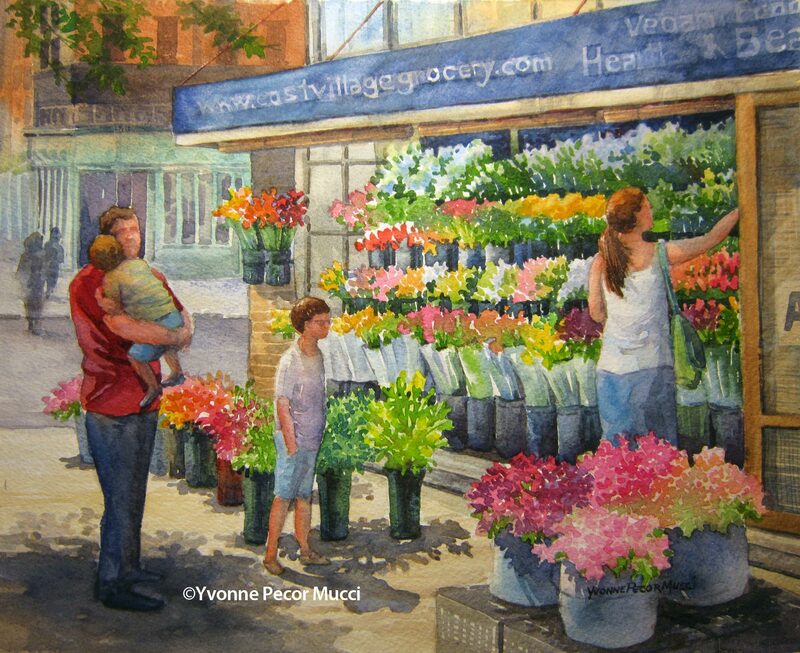 The following Saturday, this painting continued as part of a watercolor demonstration during the Arts Festival in town. Thunder storms rolled in, so it had to be finished in-studio. Click on any of the photos for a detailed view. 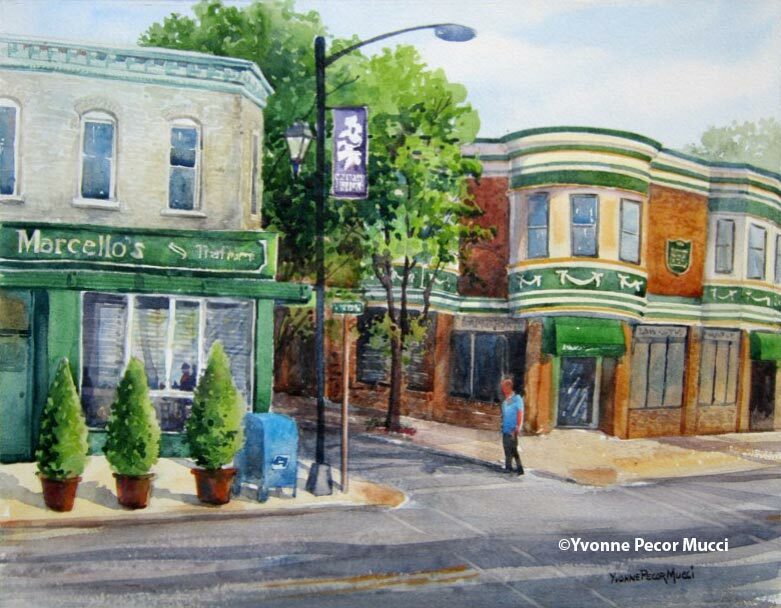 I am thrilled this painting will be part of the township’s permanent collection! This is a view seen up and down the eastern seaboard. 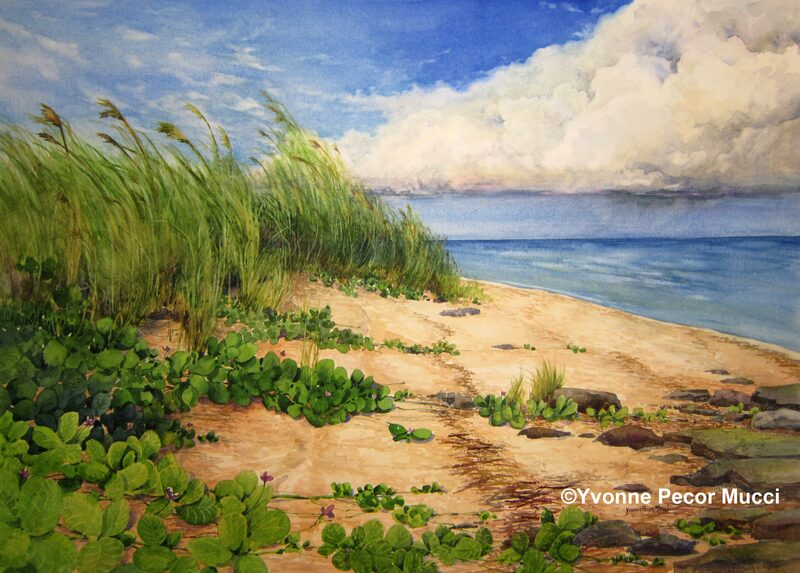 It is of dune grasses waving in the breeze along the shore on a beautiful summer day. I love the dynamic clouds that form over the ocean along with that panoramic view giving one the feeling of wide open space. 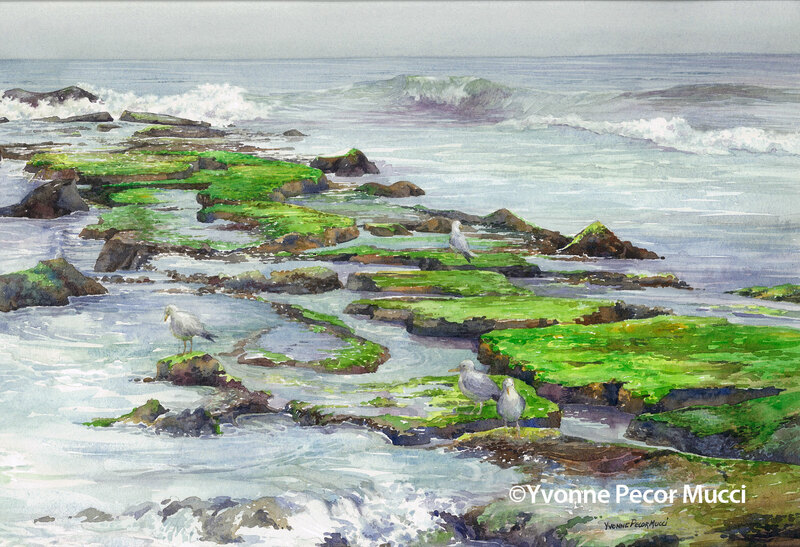 “The Shore” watercolor is painted on 140# Arches cold press. 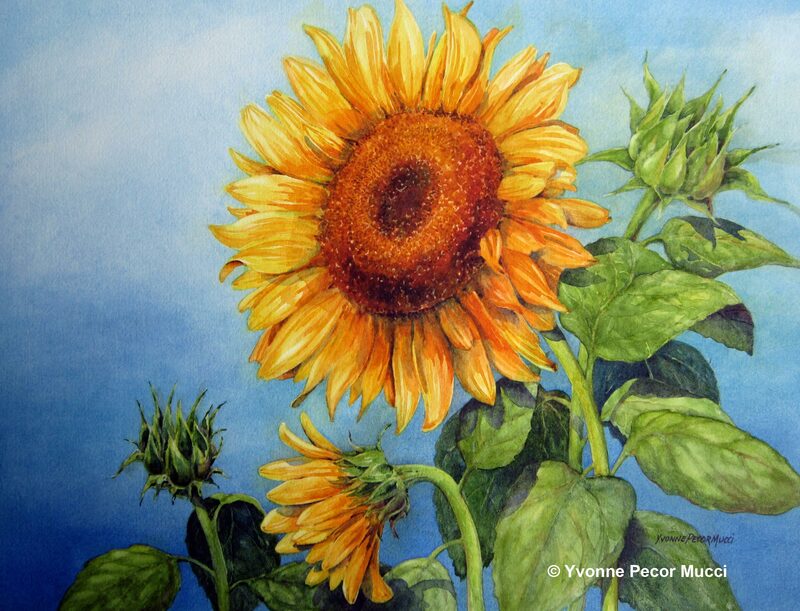 This watercolor is one of 17 paintings that I will be exhibiting at the Galleria Deptford. 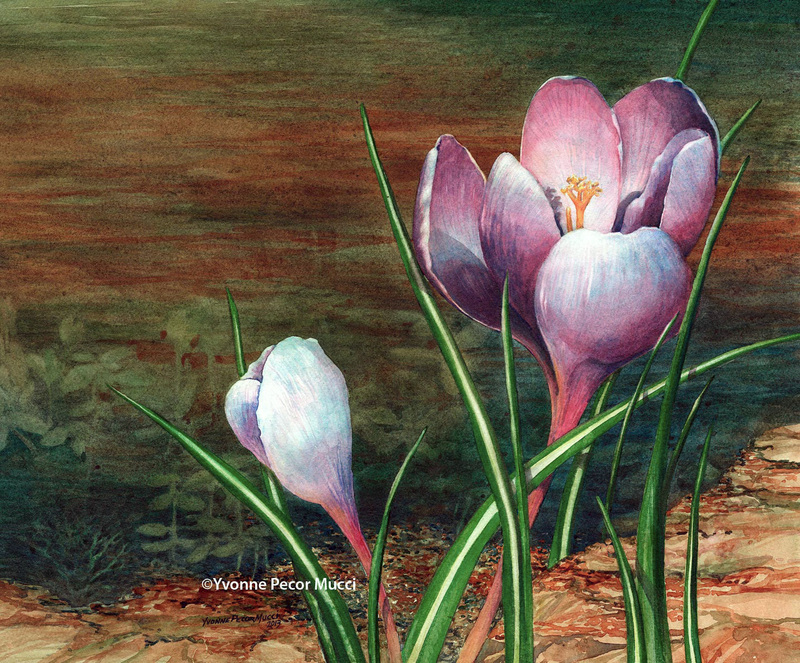 The artist reception is Sunday, April 13 from 2 until 4pm. Galleria Deptford is located in the Deptford Municipal Building, 1st and 2nd floors. For more information on this venue, visit www.thelivingartsclub.org Click on the above painting to view details. 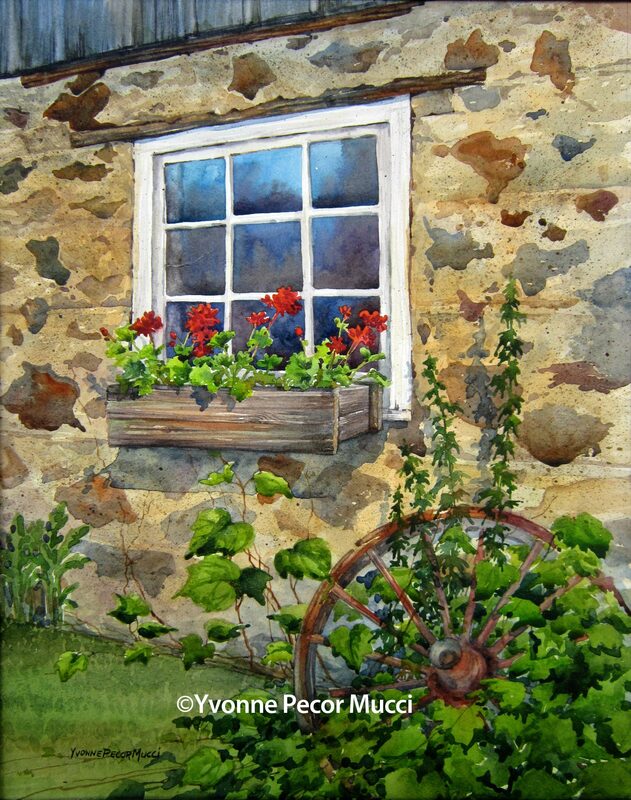 Painting inquiries to mucciyvonne@yahoo.com All artwork is ©Yvonne Pecor Mucci. No reproduction without written permission. When you take a walk in the woods, its beauty is unveiled with each turn in the path and season. 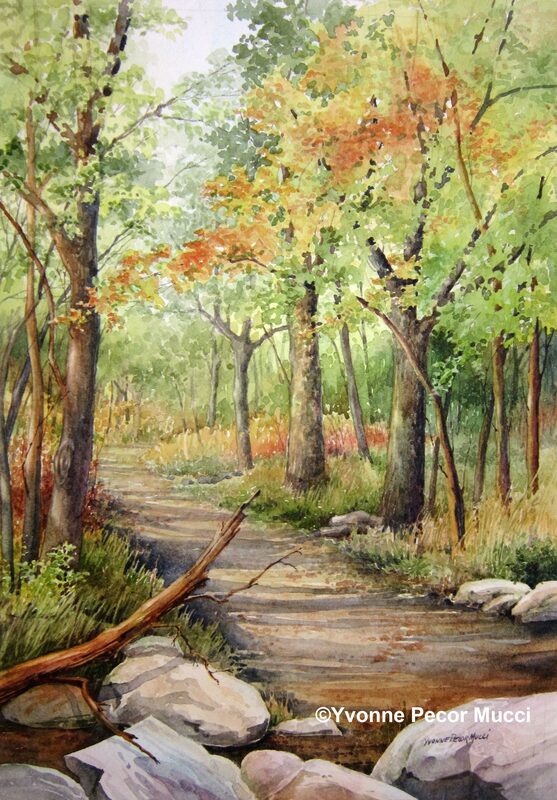 Wooded Path watercolor is a combination of different Forest Preserves at the very beginning of the fall season. It is painted on 140# Arches cold press. Click on the painting to see details. 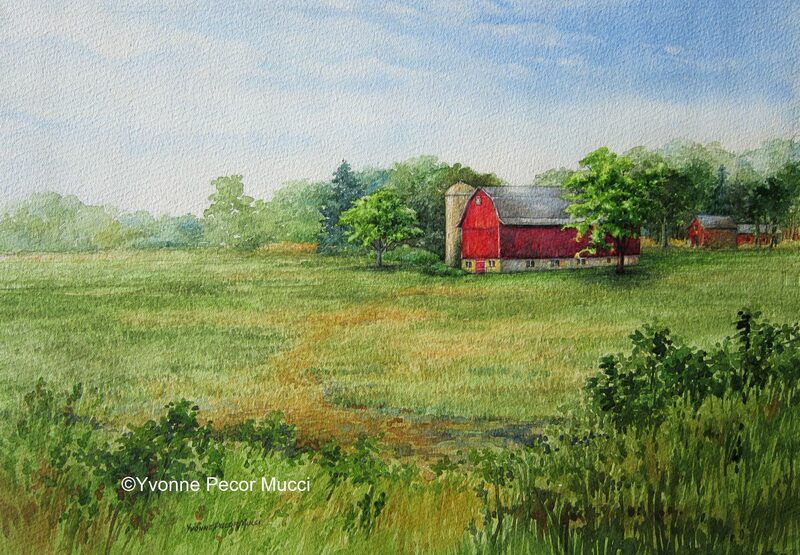 This Red Barn was found while traveling near one of my favorite midwest towns, Cedarburg, Wisconsin. You could get lost in the wide open space. 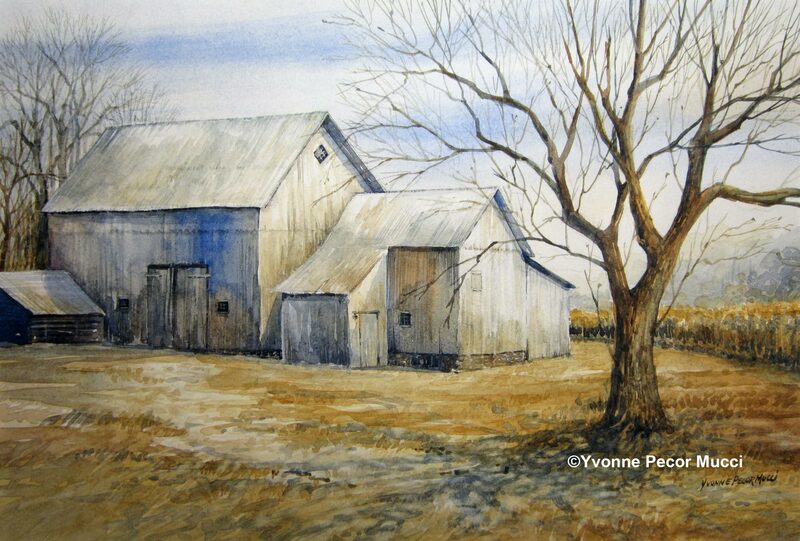 There are many barns in this area of the country. Such a beautiful place. This watercolor started as a small study for a larger painting and I found myself not stopping till it was a finished piece. Click on the painting for a closer view. I am always photographing old barns. Taking the photo is the simple part. Simplifying the subject is a little tougher. I framed this painting and it has grown on me. Always surprised at how a painting looks once it is framed! Entertainment by the ocean’s edge is never ending down the shore. It was late afternoon on a cloudless day and I wanted to capture the contrast of the white surf against the dark blue water in this watercolor. 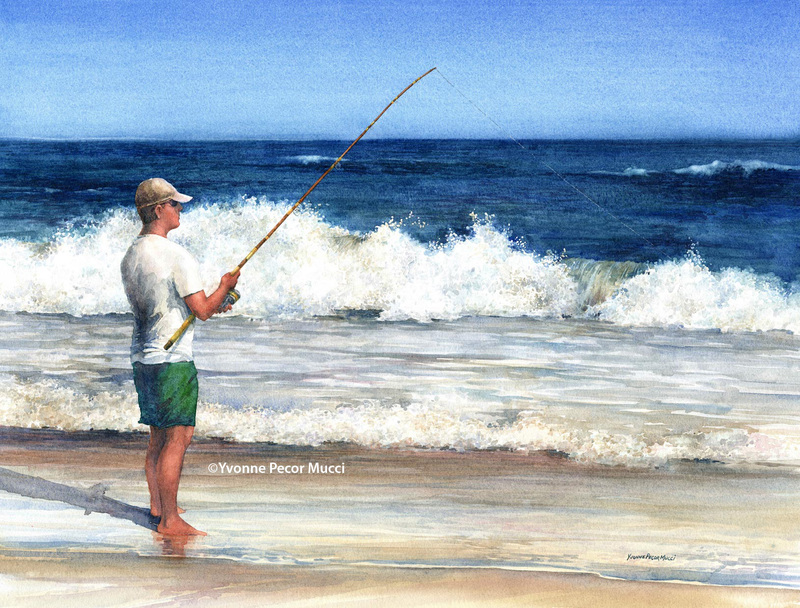 The surf fisher was lit up by the sun casting long shadows on the sand which set up a familiar scene that I had to paint. 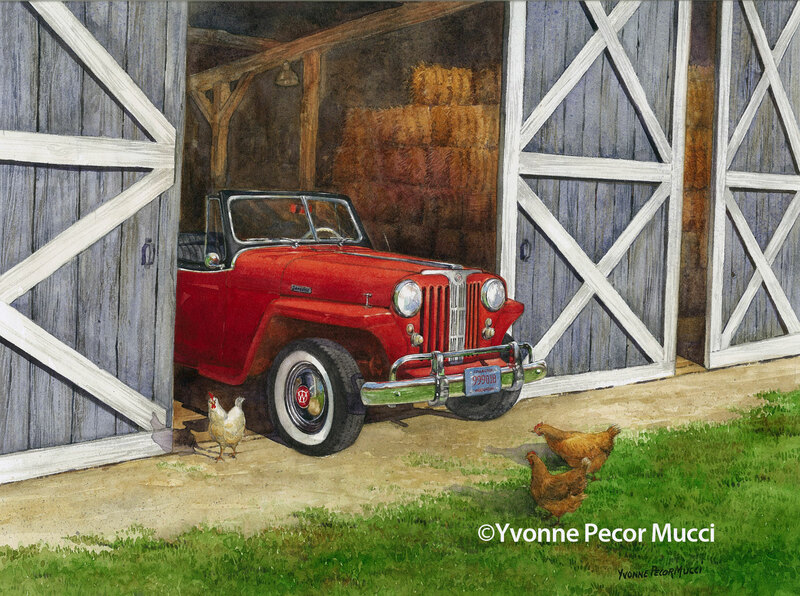 It is painted on 140lb D’Arches watercolor paper. You can click on the image to see a more detailed view of the painting. This painting will be part of the Gloucester County College exhibition starting May 4th through the first week in June. Artist reception is May 4th at 12pm till 2pm. This wren birdhouse has hung in our backyard for years. My father-in-law made this and my daughter painted it when she was very young. The wren’s sing to each other all day. This is a small study (6 x 8) which I did to figure out color and composition for a larger version. I had the pleasure of painting with a friend and she suggested trying her favorite watercolor paper – 140lb Cold Press, Fabriano Artistico. I love the way this paper took on a lot of water letting the pigments be manipulated for a longer period of time. Lifting color was quick and easy. Now I am looking forward to working on the larger painting.